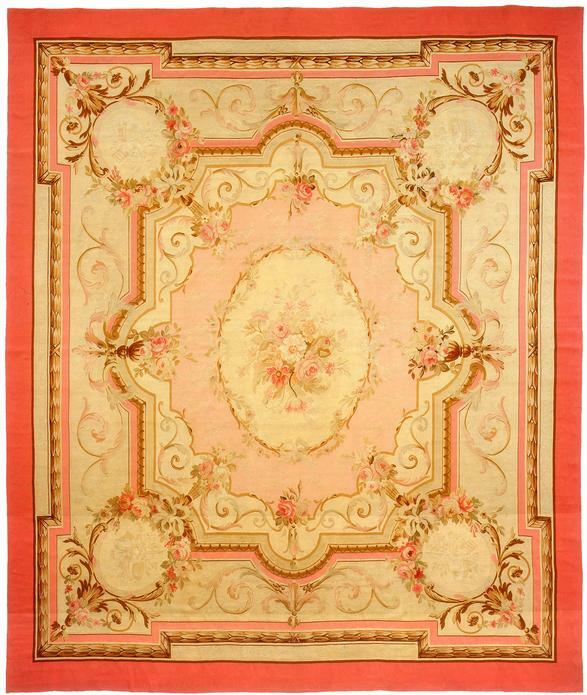 10' 3" x 12' 3"
Aubusson - 10' 3" x 12' 3"
During the eighteenth century, the European interest in Oriental rugs and carpets suddenly dropped off, giving way to locally produced floor coverings and tapestries utilizing a design tradition of purely western or classical derivation. French Savonnerie pile rugs and Aubusson tapestry hangings and carpets like this example set aside the opulent and dazzling effects of Oriental color in favor of a cooler more muted palate, just as they turned away from the intricacy of Islamic arabesque designs in favor of the restrained rhythms and attenuated proportions of vinescrolls and cartouche medallions of classical, Greco-Roman derivation popular in Europe since the Renaissance. The discovery in the late eighteenth and nineteenth centuries of the richly decorated of houses of Roman Pompeii and Herculaneum greatly accelerated this process, offering countless new models and possibilities to European textile designers. This example, with its scalloped and indented frames and its delicate acanthus scrolls, oval medallions, and soft colors clearly recall the ornamental wall paintings and stuccoed ceilings of Pompeii. Though made in the later nineteenth century, its preserves the restrained, refined Neo-Classical elegance that reigned supreme in France and the rest of Europe from Louis the XIV to Napoleon and beyond.